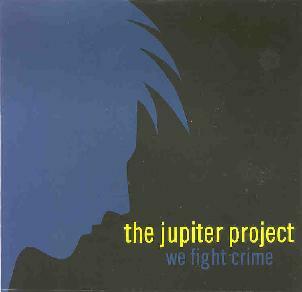 The Jupiter Project - "We Fight Crime"
The Jupiter Project is a Boston-based 3-piece that describe themselves as a techno-pop-rock band. The trio consists of Jonny Pape on guitars and vocals, Sue Boyer on bass, keyboards, programming, and vocals, and Jim Uzdarwin on drums. It's hard to pinpoint what the band is about from the three tracks on this CDEP, as they're a bit different from one another. "Seven Hours, Seven Days" is easily my favorite, being a garage rock tune with a raw bashing guitar sound that I liked. The music is also embellished by synths which give a freaky spacey edge to the music, but the electronics are clearly secondary. Still, the guitar goes into a mini-wah'd jam that adds a garagey trippy element to the bands sound. "A Tiny Point" is much fuller and thrashes nicely, but has a "clean" sound that didn't have the same "edge" to it that "Seven Hours, Seven Days" has. "Gray & Eye" grabbed me a bit more. It's moody, with crashing psychedelic guitar bits, piano, and tribal percussion, and the vocals sound a bit like R.E.M. 's Michael Stipe. Not bad. I wouldn't mind hearing more from The Jupiter Project. They've got possibilities for creating songs backed by interesting music. For more information you can visit The Jupiter Project web site at: http://www.thejupiterproject.com. We Fight Crime is not available for sale, but you can receive a copy for free by emailing hugo@thejupiterproject.com.